Blueberry pancakes – I made those just yesterday morning. Blueberry muffins – that will be today. I love them, my kids love them, my husband and my mom too. They are in season and we just can’t get enough! A while ago, I read this quote from another blogger. Integrate the arts as you would add in blueberries: put in just the right amount and fold gently. At the time I was reading up on some of his tips on life, health and fitness, but this quote struck a chord with me because it rang true for the arts as well. That’s what arts integration is – much like a method of folding blueberries into a batter, the arts must be folded into another content’s lesson. They must be part of the recipe for great education and not simply the topping. The fact is, I never really liked blueberries as a topping. Usually they are cooked down and sugar is added to them, they seem to take on another form – not quite what was intended. I’m thinking of those desserts with the fruit on top. The fruit is placed in a beautiful arrangement atop a creme filled pastry, but then sugar and some kind of glossy finish is layered over it, transforming the natural beauty of the fruit into something artificial. The arts are the same way. If we only lay the arts atop a lesson – “Draw an illustration to go with your story,” it’s not going to be real, but superficial. Your students will think of the drawing as either a fun break from the story writing or a hassle to get through fast when they are done writing. However, if the artwork is integrated into the assignment and students are taught and asked to use various art skills, then the illustration will have as much purpose as the writing itself. Think of the arts as blueberries. Quite frankly, they are great in their purest form. I know my kids can polish off a pint in one sitting, one by one or by the handful – easy. The arts are also great by themselves. In fact, they should be enjoyed in their purest form. This is arts education. And a well rounded education will provide for this. But blueberries are great in other things as well. Not necessarily the glazed over, artificial form (although some would argue with me on this – go ahead, 😉 ) but when they are gently and purposefully folded into the batter. Think about that analogy. When you fold berries in, you are gentle. You do not want to harm, bruise, burst or smoosh the blueberries. When you fold, you are purposeful. 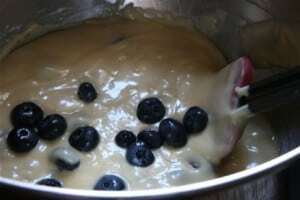 You may measure or eyeball just the right amount so that neither the berries or the batter is overpowered by the other. The same holds true when you create your arts integrated lesson plan. You are careful to stay to the integrity of the art form and purposeful in the use of it, balancing it with the other content area(s) you are teaching. So, as you think about creating new arts integrated lessons or revamping older ones, consider the blueberry: put in just the right amount and fold gently.